Miniature Caramel Apples prove that big taste can come in a small package! Small balls of apples are dunked in chocolate, then given a coating of smooth, chewy caramel. They’re as delicious as they are adorable, and Miniature Caramel Apples make the perfect party appetizer or favor. It’s not traditional to coat apples with candy coating before covering them with caramel, but in this recipe it’s absolutely necessary. Without a protective coating, the moisture in the apples causes the caramel to slide right off. This recipe yields between 12-16 mini apples, depending on the size of your scoop and your apples. Prepare a baking sheet by lining it with aluminum foil and set aside for now. Use a melon baller or small candy scoop to carve small round balls out of the apples, making sure to always have one surface with apple skin. Pat the apple balls very, very well, getting them as dry as possible. Place the apple balls skin-side up and insert the toothpicks or lollipop sticks into the top. Melt the candy coating in the microwave and stir until smooth. Dip each apple briefly in the coating, making sure that the coating extends to where the skin of the apple is so that the moisture in the apple flesh is completely sealed in. Place them on the baking sheet. Once all the apples are dipped, refrigerate them until the coating is set. While waiting for the coating to set, prepare the caramel. Place the unwrapped caramels and the cream or water in a microwave-safe bowl and microwave in 30-second intervals until completely melted. Allow it to cool, stirring occasionally, until it is still warm and pourable but no longer hot to the touch. Once the caramel is melted and the coating on the apples is set, it is time to cover the apples with caramel. This can be tricky because the coating will start to melt if exposed to hot caramel, but if the caramel has cooled down it is difficult to manipulate. The following method works best for me: lay some waxed paper or foil on your work station and spray it with nonstick cooking spray. Place big spoonfuls of caramel on the foil, and use your hands (sprayed with nonstick spray) to pat them into thin circles. Pick up a circle and wrap it around the apple, pulling and patching it with your fingers as necessary. Wet your fingers occasionally to prevent the caramel from sticking to your hands. If the caramel has cooled enough it should be easy to manipulate in this way, and this method ensures a smooth and even coating of caramel that does not melt the candy coating. If desired, dip the bottoms of the caramel apples in chopped nuts, coconut, chocolate chips, or sprinkles. Place the apples in the refrigerator to set the caramel, and if necessary, use your hands to re-shape any droopy apples before serving. Miniature Caramel Apples are best the day they are made, but if they have been properly assembled, they will keep for an additional day or two in an airtight container in the refrigerator. Click Here to View All Caramel Apple Recipes! 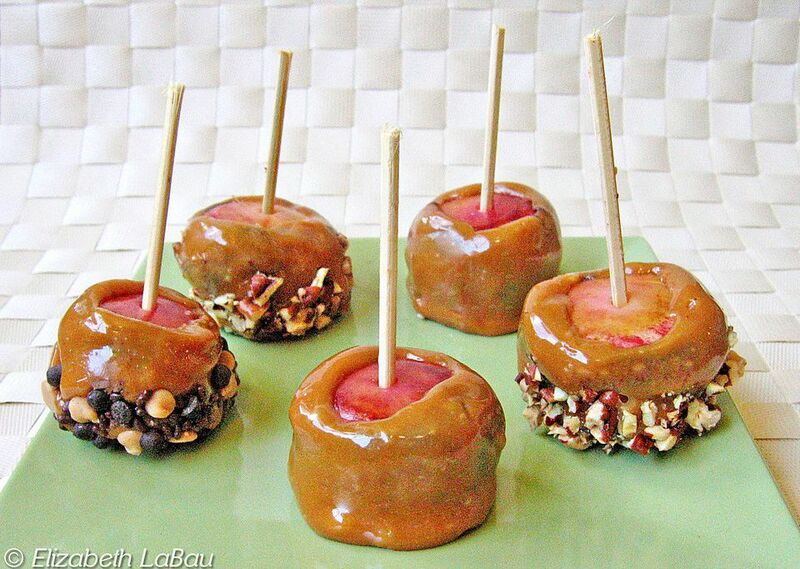 View All Apple Candy Recipes Here!